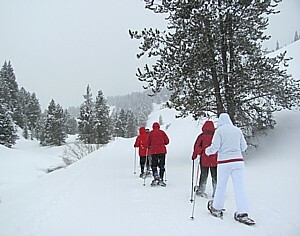 Scheduled March 18-21, 2012, the Colorado Snowshoe Walk is priced $1295 per person, based on double occupancy, and also includes the hotel’s famed ghost tour, entrance to Rocky Mountain National Park and snowshoe rental. Ideal for both first-time and long-term snowshoers, the snowshoe walk pairs a leisurely exploration of the Rocky Mountain’s wintry white scenery with opportunities to unwind in one of the country’s most historic hotels. The 103-year-old Stanley Hotel is a member of Historic Hotels of America. Named by National Geographic Traveler as purveyor of one of the “50 Tours of a Lifetime,” and by National Geographic Adventure as one of the “Best Hiking Companies,” The Wayfarers offers an eco-sensitive “walking” holiday of both culture and fitness in 14 countries with 46 itineraries and 80 departure dates. Walks cover Northern Ireland, Croatia, Czech Republic, France, England, Ireland, Wales, Scotland, Switzerland, Italy, France, New Zealand, Alaska, Colorado and Southwest USA, and a barging/walk combination in Burgundy. Now in its 29th year, The Wayfarers offers exclusive entrees into homes and gardens otherwise closed to the public, graceful accommodations, outstanding cuisine, and meetings with local residents. Walks are from 6-13 days and are rated on a five-level challenge scale. The Wayfarers is also a member of Trusted Adventures, www.trustedadventures.com, dedicated to the highest standards of small-group travel and to giving back to places visited. Contact Wayfarers at www.thewayfarers.com. 800-249-4620.